Several weeks ago our school participated in the Mid-States Shared Gifting Program organized by RSF Social Finance. Inspired by the work of Rudolf Steiner, RSF is a pioneering non-profit financial services organization dedicated to transforming the way the world works with money. Nurturing the belief that inquiry and dialog are essential to transforming people’s relationships with money, Elise Ott Casper (1919-1997) bequeathed the majority of her estate to RSF to establish the Mid-States Shared Gifting Program. The program follows a unique method which allows each participating school to engage in the granting process of the available funds. This includes review of proposals, verbal presentations by each school, and final decisions in distributing the fund. The group continually delves into the spiritual foundations of giving, granting, and receiving. This year 14 schools attended and collectively decided how to distribute $65,000 among all participants. Our faculty chair, Kristine Fiskum and Director of Development, Anita Zagraniczny served as our school representatives. Mrs. Fiskum led development and presentation of DVWS’ proposal for this year. Our school applied and obtained significant support for two key initiatives: year-round professional development visits, and the creation of a professional development model program guide that can be reproduced and revised by other schools. Specifically, to effectively support teaching and the growth of enthusiasm teachers have for Waldorf Education, a qualified professional development consultant would visit our school for one week, four times per year, ideally for three years. During each visit every teacher in every program would be observed to allow for supportive review and goal setting, geared toward a better understanding of Anthroposophy, Waldorf instruction practices, healthy communication, renewal of self, and strengthening of the curriculum. For the parent community and school as a whole, the professional consultant’s visits would include parent nights on a variety of topics such as demystifying Waldorf education, how each of the special subjects interact with the rest of the academic curriculum and child development, the importance of parent-teacher relationships, and parenting and teaching through developmental changes. Our presentation estimated that the annual cost of our initiative would be $14,500 to be funded through our own budget as well as through Title I and II funds, in conjunction with our fundraising efforts. We requested $5,900 through the Mid-States Shared Gifting Program and were granted $4,900 to support our initiative. As the direct result of the above program, our community has already experienced a highly informative presentation by Waldorf veteran, Chris Kelly. As parent and member of the administration I am deeply grateful for this ability to deepen my understanding of Waldorf education. We look forward to Chris Kelly’s next visit in January and to her support in nurturing our mission. We are grateful to RSF, the group members, and to Elise Ott Casper for her initiative and generous fund inception gift. 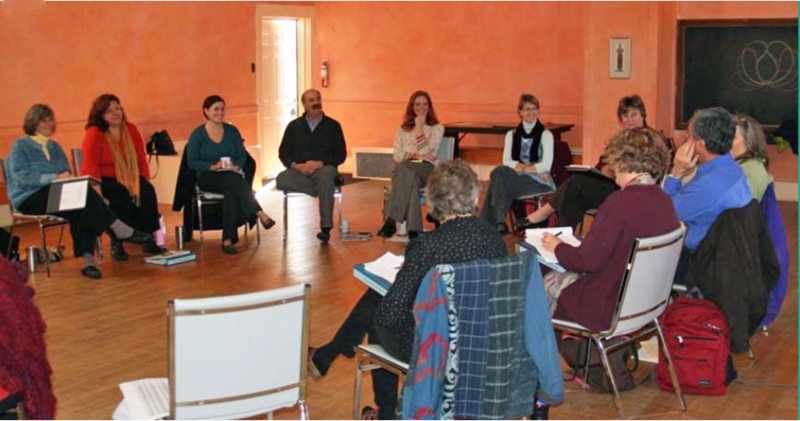 Da Vinci Waldorf School has been part of this working group for over 10 years. Did you know that four years ago the concept of shared gifting transformed our traditional annual appeal here at Da Vinci Waldorf School? Instead of the Annual Fund initiative, we now have the Giving Circle, which aims to bring our community together in a way very similar to the Mid-States Shared Gifting Program, inviting each one of us to participate in the giving of funds and in proposing and collaborating on the best use of those funds for the betterment of our school. Shared gifting is about more than money, it is an opportunity to create a spiritual connection within the community, uniting us throughout the year. I am proud to report that Da Vinci Waldorf School’s model of the Giving Circle is being offered to all Waldorf schools as a guideline of how to provide parents a stake in fundraising as well as empowering donors, creating new energy and optimism within the community. Please keep in mind the need for continued professional development for our faculty during the upcoming Giving Circle fund sharing event on February 9th. While the majority of funds to ensure the existence of the professional development program for this year has been already secured, our faculty and staff will be seeking support from the members of our community for the full funding.